Come learn what your RSDA is doing for you! Get a Pebble Mine update and get involved. There will be a Membership Q&A as well as free food and (non-alcoholic) drinks. We will be hosting a Townhall from 6-8 pm on March 1st, 2019 at the Hotel Captain Cook. The meeting is open to our members and any Bristol Bay stakeholders. Get informed and involved, find out what the RSDA is doing for our fishery and get the latest updates on Pebble Mine. The Bristol Bay Regional Seafood Development Association (BBRSDA), which is financially supported by over 1,800 regional commercial fishing businesses and strongly opposes large-scale mining in the Bristol Bay watershed, is outraged at the irresponsible and negligent conduct unfolding in the proposed Pebble Mine permitting process. A 90-day comment period is far too short of a time period to review and comment on the recently released Draft Environmental Impact Statement (EIS). The speed at which insufficient materials are being pushed through this mine’s permitting process is irresponsible given that the Bristol Bay salmon ecosystem is a biological wonder of the world. This region contains the world’s largest wild salmon runs, which have supported a rich culture for millennia and sustained a thriving commercial fishery for more than 130 years. The Bristol Bay region accounted for approximately half of the entire U.S. commercial salmon harvest value last year (producing a preliminary salmon harvest of 233 million pounds worth $281 million to commercial fishermen). Bristol Bay is home to the most valuable wild salmon fishery in the world and is the crown jewel of Alaska’s salmon industry. Despite the presence of this global treasure, the U.S. Army Corps of Engineers (USACE) scoping reports were severely lacking and do not address many important concerns raised during the public comment period. Specifically, the USACE scoping report did not recognize the virtual certainty of acid mine drainage or how contaminants would be hard to contain given the region’s porous hydrology, in addition to many other shortcomings. Astonishingly, the draft scoping report was released in May 2018 and is nearly identical to the final scoping report released just a few months later in August 2018. Now, the USACE plans to open a 90-day public comment period to review a massive Draft EIS document. The lack of adequate time for public comment and the unresponsiveness of USACE’s final scoping report to address public comments is neglectful to the people who rely on salmon for survival and livelihood. The Pebble Limited Partnership claims the project will create 850 jobs during mine production, but these temporary, new jobs come at the risk of far more existing jobs that rely on sustainable salmon runs. The Bristol Bay commercial fishery directly employs 14,800 men and women in Alaska, and the fishery creates an additional 8,600 downstream and secondary U.S. jobs (Economic Benefits of the Bristol Bay Salmon Industry, July 2018 – link). In fact, this fishery directly employs over three times as many workers as Alaska’s entire metal and mineral mining sectors. In addition, there are thousands more who rely on Bristol Bay salmon for subsistence purposes or sportfishing-related jobs. All these stakeholders deserve a reasonable amount of time to understand the Draft EIS and submit a public comment about a mining development which could drastically alter the fate of their lives. Anything less is simply negligence on the part of government. Furthermore, even if large-scale mining and salmon can somehow coexist for eternity in Bristol Bay, there will likely be irreparable damage to the consumer perception of Bristol Bay salmon. The BBRSDA has invested over $1 million in marketing Bristol Bay salmon, with promotions in over 1,000 U.S. stores last year. Pristine habitat is a key selling point for Alaska salmon, and therefore a large, open-pit mine in the headwaters of Bristol Bay has the very real potential to damage the value of fishery resources regardless of the mine’s impacts on salmon habitats. A negative perception of the mine would likely affect Alaska salmon fisheries in other regions too, similar to how the Exxon Valdez Oil Spill negatively impacted markets for fisheries in regions unaffected by the disaster. Our membership is also concerned that the USACE is not adequately considering the findings of the Environmental Protection Agency’s Watershed Assessment which found that a mine of this size would pose an unacceptable risk having the world’s largest open pit mine using untested technology at the headwaters of the world’s largest wild salmon run. The BBRSDA joins other local groups in calling for a longer comment period for the Draft EIS, but fears this process is not thorough or objective and will end in a predetermined outcome. Join us in Astoria, Oregon February 22nd - 24th! We will be hosting a Townhall from 3-5pm on February 22nd, 2019 at the Hotel Elliott. The meeting is open to our members and any Bristol Bay stakeholders. The FisherPoets evening reading schedule will kick off immediately after at 5pm at 5 separate venues in Astoria. Check out the schedule here. Sitka, Alaska. 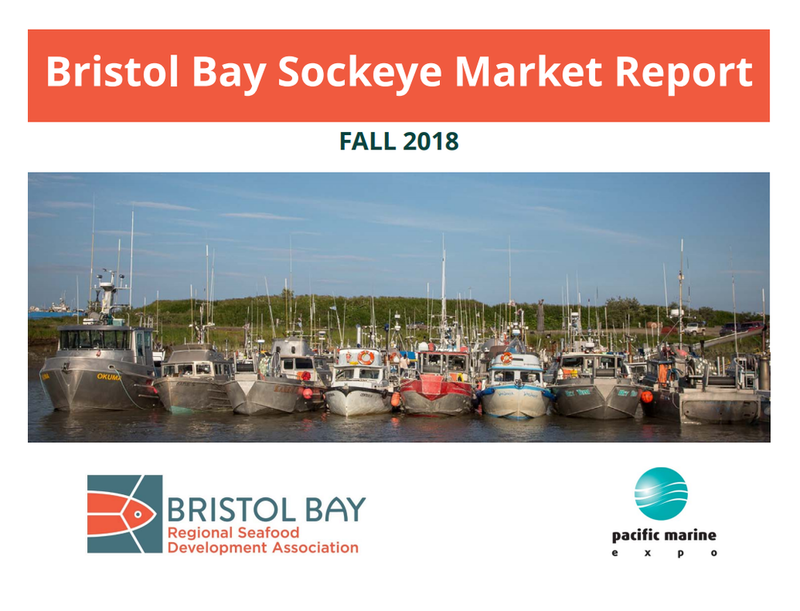 January 28, 2019 - The Bristol Bay Sockeye Salmon run not only set a record in 2018, but the brand also made a big splash at retailers across the country. The branding program was developed by the Bristol Bay Regional Seafood Development Association in 2016 in Boulder, Colorado before being launched nationwide in 2017. The brand continues to grow as more and more retailers across the country tell their customers the story of where their fish comes from, promoting in over 1,000 stores in 2018. The AMSEA and the BBRSDA seek applicants for Marine Safety Instructor Training scholarships. Successful applicants will attend AMSEA’s Marine Safety Instructor Training in Seward, April 23-28 and teach Fishing Vessel Drill Conductor classes in the Bristol Bay region, prior to the 2019 salmon season. Click here for more information. 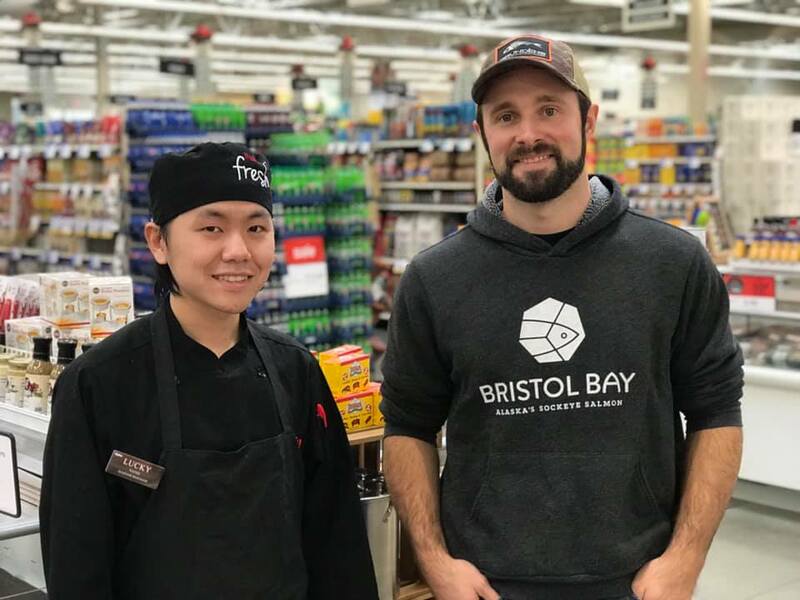 BBRSDA’s Andy Wink and Bristol Bay Fishermen visited Hy-Vee stores across the Twin Cities last week promoting in-store demos of Bristol Bay sockeye. It was a great chance to connect consumers and Hy-Vee staff with Minnesotans who fish in Bristol Bay. Big thanks to Roger, Jay, and Tom Rogotzke (pictured) and John Each for helping spread the word! The BBRSDA has committed $150,000 to support ice infrastructure projects in FY19. This program will provide up to a 100% reimbursement to Bristol Bay processors, entities, or organization on the purchase of new ice making or distribution equipment or towards the cost of refurbishing previously acquired equipment. The goal of the program is to increase ice available to the fleet on the grounds. We will begin the first round of review on proposals on February 1, 2019. Contact Cameo at cameo@bbrsda.com or call 907-677-2371 if you have any questions.